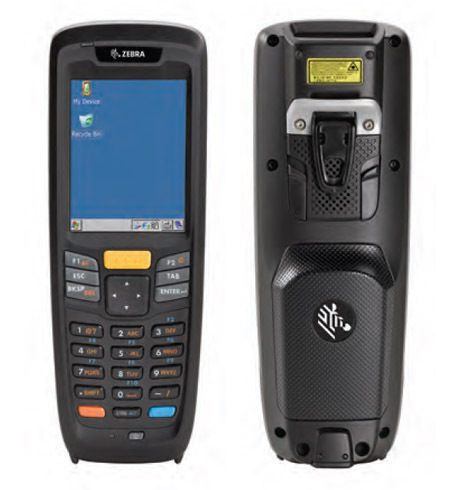 Processing large amounts of data requires an efficient tool, like the robust Zebra MC2100 mobile terminal. Increase productivity in the inventory management and of the whole company – from the warehouse to the sales area. The small lightweight casing of the handheld sits perfectly in your hand, and is specially designed for comfortable one-hand operation. This always leaves users with a free hand. Inside are high-performance components which you normally would only find in more expensive products. The fast 624 MHz processor and the very good memory configuration ensure for optimal performance at all times with desktop-style applications. The MC2100 comes preinstalled with the operating system Windows Embedded CE 6.0 Core or CE 6.0 Pro. For data entry into the 7 cm (2.8”) display with background lighting, the user has 27 keys at his disposal. Practical remote access functions simplify not only the start-up operation, but also software updates and system surveillance. To further increase the spectrum of applications, there is a range of options available on demand: touch screen, 1D/2D imager, special function keys, Wi-Fi and Bluetooth.